The railway that built a state | Write-now! 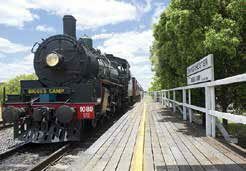 Queensland’s railway is 150 years young, writes Susan Prior. It’s Sunday morning. We settle into our seats in the Pullman sleeper carriage 1057, with its oval roof and verandas, pull-down beds and silky oak cabinetry. Originally built in 1924 and beautifully refurbished in 2002, we are about to experience a Steam Train Sunday train ride run by the Workshops Rail Museum. The platform is abuzz with the excitement of families and rail enthusiasts as they examine the locomotive and carriages. The engine patiently and gently puffs away while eager children are lifted up to see the cab. Thomas the Tank Engine T-shirts are, it seems, the garb of choice for all small boys. The formal opening of the ‘Southern and Western Railway’, yesterday, commenced a new era in the history of the colony, and one the advent of which has been looked forward to with much anxiety for some time past. In no country in the world could such an event occur without exciting the deepest interest, affecting as it must do so materially the future prospects of the inhabitants. So the first railway line from Ipswich to Bigge’s camp, soon to be known as Grandchester, officially opened for business. To give you some idea of the huge importance of this development to the edgling colony, this news story ran to nearly 10,000 words—it was BIG news. The story discussed, at length, matters that were clearly of great import: gradients, gauge, radii of bends, throttle valve levers, bridge construction and tolerances in the engineering. No facet of this great project was omitted—it was a descriptive record rich in magnificent detail. Brisbane was first established as a convict colony in 1824, and Ipswich was a convict camp supplying lime and sheep for the colony. It wasn’t until 1842 that the region finally opened for free settlement, with Brisbane and Ipswich both keen rivals for commercial supremacy as Queensland’s capital. The country was destitute of bridges or culverts and the mud tracks, passing as roads, were always bad and frequently impassable for weeks and sometimes months. It was authoritatively stated at the time that it was no uncommon circumstance for 100 drays to be detained waiting for the possibility of travelling. An efficient mode of transport was urgently needed for the colony to prosper. Three hundred navvies were brought from England to help build the first railway line in the colony. By 1865, the railway stretched a tentative feeler out from Ipswich westwards towards the rich agricultural estates of the Darling Downs. On the day of the opening ceremony, Ipswich’s banks and public offices were closed for business; the town and the four steam engines procured for the new railway were festively decked-out with flags and banners. It was a gala event, with people descending on the town from all parts of the colony to watch history being made. Accommodation was at a premium, such was the excitement. Five-hundred lucky guests, the ladies dressed in their nest most colourful attire, made the journey by train to Bigge’s camp for plenty of speeches accompanied by rousing cheers, and a celebratory luncheon in the marquee erected especially for the occasion. Two years later the link to Toowoomba was complete, thereby reducing a seven-day journey to just five hours. Still, for the next few years, the section from Brisbane to Ipswich was either by paddle steamer or road. It could take a full day navigating the shifting sandbanks and rocky outcrops by river, or a couple of unpleasant and uncomfortable days by bumpy horse and cart. 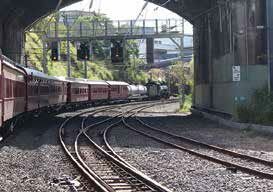 By February 1875, 140 years ago, the line from Ipswich to Brisbane was completed. Even so, it terminated at Oxley Point, in what is now Chelmer where the Walter Taylor Bridge stands, and passengers and goods crossed the river by punt. In 1876, the Albert Railway Bridge was built, opening up the area to further development. 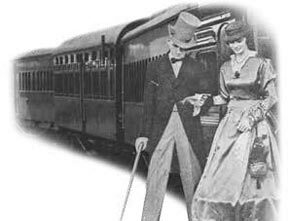 Rail became the preferred and even fashionable way to travel. In February 1893, three cyclones hit Brisbane in quick succession causing severe flooding, washing away the Albert Bridge, and so the building process was begun again, this time with a steel truss design. This bridge, also called the Albert Bridge, was completed in 1895 and still stands today. It’s on the Queensland Heritage Register. The early settlers’ tenacity paid off; Queensland prospered, with the railway transforming rural isolated pockets to thriving suburbs and hubs of commerce. Today we have a rail network that can transport us to many of the far-flung destinations in our immense State, while a network of railway lines de nes our suburbs and dictates how many of us live as commuters. The age of steam, even though it is no longer critical to our prosperity, still mesmerises and charms. As we travel through Brisbane’s suburbs in Pullman sleeper carriage 1057, it is wonderful to witness the smiles on people’s faces as we pass by. It seems everyone loves the romance of the steam train. If you haven’t discovered it yet, then this year is probably a very good one to do so. For more information about Steam Train Sunday, visit: www.theworkshops.qm.qld.gov.au. Hi Susan, Your [sic] a goddess — everything that Lindsay said was true! Very happy with this version and many thanks.